The Hyundai Sonata is one of the more popular mid-sized sedans on the road. 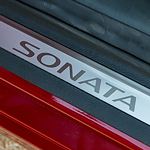 The Sonata has been known for years as a reliable and fuel-efficient vehicle. The Sonata is now available at Bill Dodge Hyundai in Brunswick in a variety of different trim lines. The Sonata comes in an SE, SEL, Sport, Limited and Limited 2.0T trim. The technology package is available on the SEL and the Sport trim lines. One of the features that is a part of the technology package is lane keeping assistance. This feature monitors the road. If you start to drift out of the lane, an alert sounds to make sure you stay within the lane markings. You also receive smart cruise control as part of the technology package. This feature has sensors that monitor the speed of traffic ahead. It will adjust the speed of the cruise control to keep up with the flow of the traffic.